This joint Venture between McCawley’s and Delaney’s is the biggest Western Bar in Guangzhou, if not China, at almost 1,000 square meters and is conveniently located on Hua Li Lu (opposite the Eur Am Medical Centre) in Zhujiang New Town. Spread out over two floors, on arrival the first thing everyone will notice is the amazing façade that stretches over 30 meters wide. Fitted in hard wood and stained antique the façade is finished with old lanterns and brass goosenecks. 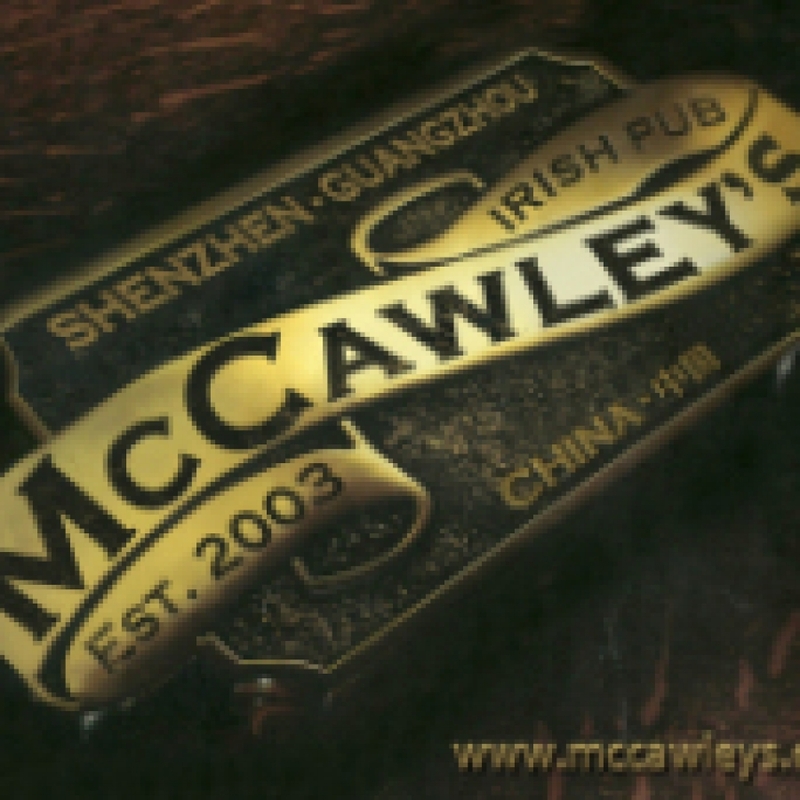 Giant brass letters spelling out McCawley’s confirms you have arrived at the right place. On either side of this Bar, is The Deck, which can be best described as chic alfresco. A combination of warm tones, natural slate and funky artwork combine well with our brass finished pressed metal ceiling to form a unique setting for a casual lunch, girls night out or even the next corporate function. The concertina doors open the entire façade to reveal another area to explore or to simply step outside to answer that important phone call. But wait, there’s more…. Time to go upstairs A polished copper sweeping-staircase, takes you to our second floor where you will find three clearly defined sections. We have The Back Room – an intimate section that easily seats 60 persons, with high comfortable mahogany drink stands, leather chairs and private booths.The seating offers the privacy when required or the perfect location to soak up the atmosphere during that big sporting event. The Back Room is one of the many areas in our premises suitable for private group bookings as it can be closed off away from the rest of the crowd, yet still able to enjoy the atmosphere from the rest of the premises. Then there is ourDelaney’s Bar and Snug Areas – a well-stocked bar featuring no fewer than 50 different Irish Whiskeys, a full cocktail menu, premium pours & quality wines not to mention the great draught beers on tap were we promise the perfect pour every time. The 25ft long bar counter is finished in a hand-cut illuminated glass front that is both welcoming and kind on the eye whilst the huge mirror behind the bar accentuates the warmth of an old Celtic Tavern. Then you enter The Stage, which will feature our House Band “Fill the Gap” five nights a week. Dedicated to quality live acts, The Stage is set to be Guangzhou’s best live music venue and we promise to keep the entertainment flowing with guest acts, comedians and theme parties throughout the year. Fitted with state of the art Harman audio complimented with an acoustically sound interior,The Stage makes for the perfect location for the after dinner crowd to let their hair down and dance into the wee hours.Now that you have had the tour it’s time to sit back and relax and let the McCawley’s team look after you, so why not start with the food menu. Food is extremely important to our operation and we have dedicated 200sq meters of our premises to the Kitchen Area – our menus will be a mix of Traditional Pub Food & Gastro Pub Food with a selection of Tex-Mex favourites included. The kitchen will be operating from 11am till after midnight; as soon as the business settles downwe will also open for breakfast service. Then in October, when the weather cools down, we will begin our Carvery service at weekends which runs all day from 12-6pm Saturday & Sundays. Thank you for taking the time to read this, we very much look forward to welcoming you to our new premises.